Plastic tip and flexible design for safety and easy cleaning. 3-1/8" projection. Plastic tip and flexible design for safety and easy cleaning. Overall projection 3.22." Screw included. Plastic tip and flexible design for safety and easy cleaning. 3-1/8" projection. Plastic tip and flexible design for safety and easy cleaning. 3-1/8" projection. Plastic tip and flexible design for safety and easy cleaning. 3-1/8" projection. Fits a variety of applications. Offers attractive, easy-grip design. Rounded contour for comfort and appearance. Mounting screws included. Bagged. Plastic tip and flexible design for safety and easy cleaning. Overall projection 3.22." Screw included. Plastic tip and flexible design for safety and easy cleaning. Overall projection 3.22." Screw included. Plastic tip and flexible design for safety and easy cleaning. Overall projection 3.22." Screw included. 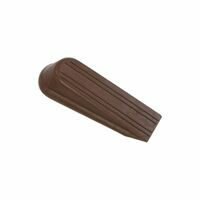 National Hardware Door Stop, Series: SP334BC, Wedge, 4 in Height, 1 in Width, Suitable For Use With: Doors Upto 1-1/4 in Clearance, Rubber, Brown Plastic tip and flexible design for safety and easy cleaning. Overall projection 3.22." Screw included. Plastic tip and flexible design for safety and easy cleaning. 3-1/8" projection. With rubber tip to protect door and wall. Adjustable screw. Flexible for safety and ease of cleaning. Spring helps prevent wall damage. 3" projection. Polybagged. Flexible for safety and ease of cleaning. Spring helps prevent wall damage. 3" projection. Polybagged. Plastic tip and flexible design for safety and easy cleaning. 3-1/8" projection. With rubber tip to protect door and wall. Adjustable screw. With rubber tip to protect door and wall. Adjustable screw. With rubber tip to protect door and wall. Adjustable screw. Hinged mounted to fit all doors. Will not damage or touch doors. Installs without tools. Hinged mounted to fit all doors. Will not damage or touch doors. Installs without tools. With plastic tip. With rubber tip. 3-1/8" projection. Helps prevent wall damage. 2-15/16" projection. Polybagged. Helps prevent wall damage. 2-15/16" projection. Polybagged. Economy doorstop. Spring helps prevent wall damage. 3" projection. Polybagged. Economy doorstop. Spring helps prevent wall damage. 3" projection. Polybagged. Helps prevent damage to the wall. 3? projection from the wall. Flexible design for safety and ease of cleaning. Bagged. Prevents damage to walls. Wide base stop provides better spring support. Base plate detaches from the spring for easy installation. Steel with rubber bumper. 3" Projection. Visual-pack. Flexible for safety and ease of cleaning. Spring helps prevent wall damage. 3" projection. Polybagged.